Review: Artistic sensibility in "Julian Schnabel: A Private Portrait"
"You have to have this infinite belief in whatever you're doing that is not rational. It's blind faith." That statement by Julian Schnabel drives to the core of a new documentary about the artist and filmmaker, whose creative output has stood him at the forefront of his generation, despite the lack of an easily-accessible, unifying theme to his work. Born in 1951 in Brooklyn, Schnabel was raised in New York City before his family moved to Brownsville, Texas. There the precocious young man deemed that art was his calling. The city's stark, industrial landscapes, as well as his long fascination with Mexican folk art, were inspirations for his expansive, mixed-media pop art works. In the 1970s, when he moved back to New York, he found a welcoming Lower East Side community of artists and musicians who shared his Bohemian qualities (if not his habit of wearing pajamas in public). A Neo-Expressionist, Schnabel produced expansive paintings and mixed-media collages, his output ranging from portraits and landscapes to abstracts, with his favorite scale being huge. And if you doubted that his work was created through sheer force, his hurling a jacket sopped with paint -- attaching energy as well as color to the canvas -- might just convince you. It is this blind faith in the power of art and its importance to his self-expression that comes through so powerfully in "Julian Schnabel: A Private Portrait," a new documentary from Italian filmmaker Pappi Corsicato. It combines new interviews with Schnabel, his family and contemporaries with archival footage of Schnabel at work in the 1970s and '80s. Instead, the film focuses on Schnabel's artistic spirit, his drive to transmit his life energy onto a fixed work of art. For him, it's an act of procreation. In defining himself as an artist, Schnabel also managed to draw outside the lines by directing several films, including the masterful "The Diving Bell and the Butterfly" (2007), which earned four Academy Award nominations, including for Schnabel's direction. He also directed a well-received biofilm about fellow artist Jean-Michel Basquiat, in which Gary Oldman played a Schnabelesque artist. We see Schnabel on set generously coaching actors with a passion not dissimilar to smearing swaths of paint on a very large surface. There is also much footage of him enjoying family life with his children (he's been married twice), and the Bohemian lifestyle in which he raised them. Their personal anecdotes and thoughtful musings on what were highly-unconventional childhoods are among the most illuminating regarding Schnabel's artistic sensibility. Affectionate and intimate, "Julian Schnabel: A Private Portrait" may not help you appreciate Schnabel's art more, but it demonstrates how intoxicating a life lived in the New York art world at its headiest can be. "Julian Schnabel: A Private Portrait," which recently had its world premiere at the Tribeca Film Festival, opens today in select theatres in New York City and Santa Monica, Calif., before expanding to more cities. Released by Cohen Media Group. Not rated. 84 mins. 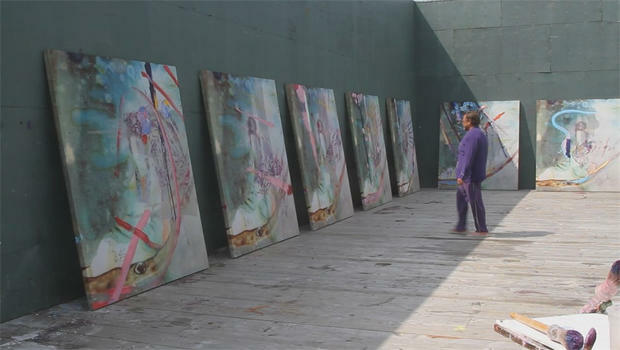 To watch a trailer for "Julian Schnabel: A Private Portrait" click on the video player below.